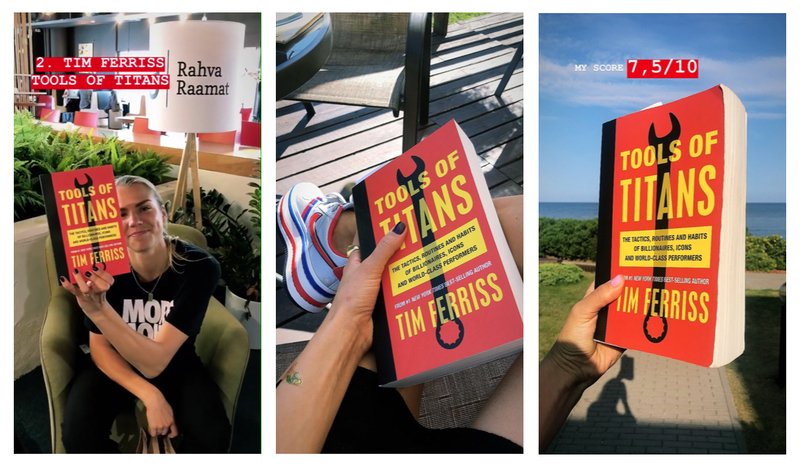 Let’s kick this first Hooligan Book Club book review off with “Tools of Titans by Tim Ferriss”. I must start with a small disclaimer: I did not pick this book for myself. I am doing a Year of Books challenge with an aim to expand my horizon & step out of my comfort zone with book selections. I blindly picked it as part of the Rahva Raamat (bookstore) recommendations. I also had a few friends here and there raving about the Four Hour Workweek by T.Ferriss so I was a little bit eager to know what’s all this fuss about. As you might have imagined, I started this book with a semi-strong prejudice. Secondly, I don’t believe in curating our lives down to the second. We are not built to be super efficient. Finally, I don’t think following the advice of the top 200 most successful people will make you successful. There’s too much luck in the game. People are always looking for that shortcut to success and neglect their common sense. Having said all of that, I kept an open mind when I dwelled in this book. The 673-page book is a compendium of over 200 successful individuals Tim Ferriss has interviewed for his podcast. The book is organized around three themes: Healthy, Wealthy & Wise. It is certainly not meant to be read all in one go (which I did) – as it’s rammed up with useful tips and recommendations. A perfect way of reading this book would be over a course of a several months – a few interviews at a time with enough time to check out some of the recommended podcasts/books/films. As I was under time pressure and barely at home this month, I was obliged to taking pictures of the pages and writing down some titles and ideas. But for others I would sugest to take more time to digest. While reading this book you need to keep in mind something that Tim mentions in the intro section: not every piece of in here advice is made for You. I read someone complaining (obviously on Goodreads) that “wow Tim must have at least 96 hours in a day to follow all this advice” and then handing it a one-star review. That’s all beside the point. I believe that everyone will find something useful from this book to change the way they feel about themselves, how they work, learn, eat or train, and the way they can even start doing a new diet plan using resources from sites as tophealthjournal online. And when it’s too much for you (in my case it was all the extreme diet stuff & investing in stocks/startups) – then skip it, but skip intelligently. Become a good public speaker (top 25%). Anyone can do it with practice. If you add that talent to any other, suddenly you are the boss of people who only have one skill. Small love-kindness exercise. (I will use this when I give workshops and need to boost everyone’s energy levels and happiness with a help of a very small exercise). Exercise: I tell the audience members to each identify two human beings in the room and just think “I wish for this person to be happy and I wish for that person to be happy.” That is it. I remind them not to say or do anything – just to think – this is entirely a thinking exercise. It’s 10 seconds worth of thinking & everybody emerges from this exercise smiling, happier than 10 second before. Create a morning ritual with easy wins: make your bed, read a few pages of stoic writing like Marcus Aurelius, meditate, do 5-10 reps of something. This will give you a small sense of pride and encouragement to achieve another task, then another & so on. 80% of the interviewed people meditate daily. I understand now more than ever why busy people need this. On a lot of occasions in life we put too much effort in things for very little to gain (a story about the guy who cycled a mountain track every day & it took him exactly 43mins. At some point he felt tired of this routine – he felt that in order to achieve this goal of 43 minutes on this track he is always short of breath, red-faced, huffing and puffing at the end, which made the whole activity more repulsive to him. He thought about quitting overall. Then one day he went cycling with a different mindset: to have an enjoyable ride, watch the seagulls fly and appreciate the breath-taking views. End result: his “lap time” was 45 minutes. All this hard pushing for the gain of 2 minutes. This is a story that really resonates with me and a range of things I’ve made myself do to “achieve a goal”. 20/80 rule. Write down the 20% of activities and people causing 80% or more of your negative emotions. To sum up, I understand why this book can stir up a debate, however I advise reading it as if you’re scrolling your feed – some posts you like and some you don’t – some captions need more of your attention and some you can just slide by – and a selected few end up in your best friends DMs.